Flying from places other than Paris, Amsterdam, Lisbon or cities in Spain is difficult because there are no direct flights and because for the indirect flights the connections are not ideal so you have to stay overnight in a connecting city on you way out and/or on your way back. Click on the tabs to find some practical tips to avoid the inconvenient flights. 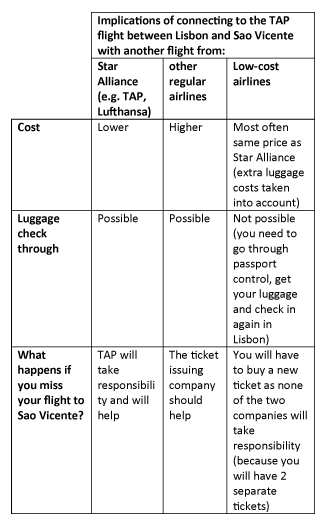 Your second choice (first choice = connection in Lisbon) is to connect with the TACV flight from Amsterdam to Sao Vicente. This means that when you arrive at Amsterdam Schiphol airport you will need to go get your luggage and take the luggage to the TACV desk to check in again. TACV flight times are quite unpredictable. Sometimes they are late and sometime they are even ….. early (without notifying all passengers). This year (2015) TACV has not always been in financial control. On at least 2 occasions, this has resulted in major flight disruptions. Avoid flying with TACV between islands if you only have a short holiday during the Christmas – New Year period. During this time the TACV flight are booked to full capacity by diaspora (Cape Verdeans living abroad) and their luggage. Chances are very high that your luggage will not arrive with you. Do not be surprised for you flight to Sao Vicente or your flight returning from Sao Vicente to be delayed for up to a week due to sandstorms. During November – March the sky of the islands can become “hazy”. This is caused by fine sand blowing in from the Sahara. About 5-10% of the time the sand becomes too dense for the aircraft to fly (the engines cannot take it). When this happens, all flights will be cancelled. This may last for up to a week. With cancellations over many days, a backlog is likely to develop, meaning that even when the air clears it may take more than a day to get on your flight from Sao Vicente back home. So if you or fellow-travelers have a critical event to attend right after arrival back home, we advice you not to take the risk. Better to plan your holiday for another period.